Take a helicopter tour above downtown Cleveland and Lake Erie's shoreline! This Cleveland flight ascends hundreds of feet above the city! Take a helicopter tour above downtown Cleveland and Lake Erie's shoreline! This Cleveland flight ascends hundreds of feet above the city, showcasing all the diverse architecture from premium vantage points. Sports fan? You’ll get an eyeful—the flight also swoops over all the stunning sports arenas before heading to the water. At the shoreline, be wowed by the beautiful waterfront properties. Aim your lens past the horizon and capture mind-blowing photos of the Great Lake. Shots like these are guaranteed to make your friends jelly. 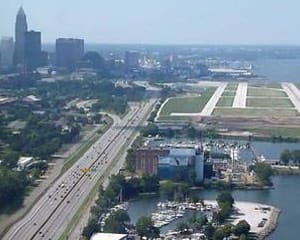 Take a 10- to 12-minute helicopter tour above Cleveland’s shoreline and three of its famous stadiums! Make our way to FirstEnergy Stadium. Travel high about the striking Quicken Loans Arena! Get phenomenal views of Lake Erie! Snap photos of all the beautiful homes and restaurants that dot its shoreline! Summer views offer bustling ports and busybodies while winter scenery casts a different kind of spell—the sprawling city really is something else! Book this Cleveland helicopter flight now!